bedrijfskundige ontdekkingsreis: The Second Machine Age Erik Brynjolfsson and Andrew McAfee. Are machines taking over? 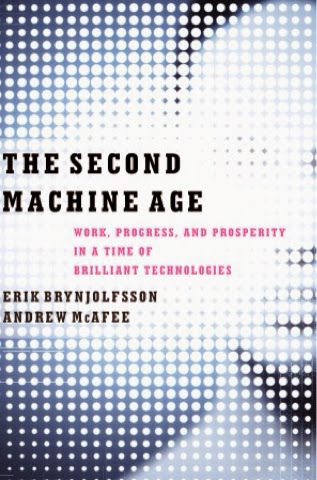 The Second Machine Age Erik Brynjolfsson and Andrew McAfee. Are machines taking over? 'The Second Machine Age' by Erik Brynjolfsson and Andrew McAfee, a necessity to read for world leaders, country governor's, business leaders, innovators, researchers, managing directors, managers, engineers, technicians, mechanics, bus drivers, doctors, surgeons, bankers, teachers, parents, children, and so on, actualy for everybody. This book is about our future and how to deal with it. It is not just a prediction, it is a scientific founded, statistic based and very readable book. It is not only a prediction it is also a well founded statement how to prepare ourselves in this second machine age. The authors started with what happened in the first machine age, the industrial revolution and the comparison with what is happening now and the past four decades. They also took Moores Law which tell us that every 18 month the number of transistors on integrated circuits doubles and the price halves. This is a logaritmic scale and if we try to count how fast a computer computes, we are not able anymore to imagine how fast this is, the numbers have to many digits. So what can we expect from computers and robots now, in the near future and in the future on the long run. In the first machine age machines took over the work from men, handcraftship. Is this a frighful future, are robost taking over? Nobody knows, even Erik Brynjolfsson and Andrew McAfee do not know, but we can prepare. We have to continu to develop ourselves, as in the first machine age. People who resisted and did not developed thereselves had a problem, people who where resilient to change, to develop thereselves, survived. Not survival of the smartest, survival of the fittest. This means, people who are able to change and can fit in a changing surroundings will survive. The authors also warn us for a separation between incomes. "The spread". There is a trend in income separation. A increase for the higher income and a decline of incomes for lower class incomes. The sandglass problem. The authors plead for the "Econ 101 playbook for stimulating economic growth": education, entrepreneurship, infrastructure, immigration, basic research. The plead for reinventing education, like manufactoring, media, finance. We should be fostering creativity, because the rote kind of skills are exactly what’s being automated. Everything what can be digitized will be digitized. Everything that can automized, will be automized. Actualy only reiterative work will be automated, like in the first machine age. So these are jobs that will disappear, but there will be new ones as well. The spread is happening now because of copying is so cheep and programming becomes even cheeper. For instance Instagram a company with only eleven employees and a few investors is sold for one billion dollars. Facebook has only 3.500 employee and has about the same turmover as Genral Electric with 300.000 employees. It is easier then ever before to become a billionair. It seems. Because it is even harder to become the number one and there no room for number two. What is the competitor of Facebook? What is the competitor of Google? And this is increasing. So the tip is, become number one in a niche field. Not the number one book seller, but the number one children book seller in book about children in western Africa ( e.g.). The authors also mentioned the biggest fear of mankind, become jobless. They quoted Daniël Pinks 'Drive' jobs give mastery autonomy and purpose. Also Voltaire wrote it before: 'Work saves a man from three great evils: boredom, vice and need. Even Gartner CEO said it: the primary will of the world is not anymore about peace of freedom, not even democracy, it is not about having family or a home not even about God. The first will of the is having a good job. The authors mentioned Robert Kennedy's speech: "Yet the gross national product does not allow for the health of our children, the quality of their education, or the joy of their play. It does not include the beauty of our poetry or the strength of our marriages; the intelligence of our public debate or the integrity of our public officials. It measures neither our wit nor our courage; neither our wisdom nor our learning; neither our compassion nor our devotion to our country; it measures everything, in short, except that which makes life worthwhile. And it tells us everything about America except why we are proud that we are Americans." Especially in the digital age, we are measuring the wrong numbers. E.g. Almost everybody has the disposal to speeches (Ted), videos (youtube), music (youtube, iTunes , spotify) information, knowledge (Wikipedia), more than ever in history for almost nothing. The music industry income has droppend a 30 percent. But there is more music, movies, information and knowledge (for free) available than ever. What does this do with the GNP? It declines, but wealth is growing. Robert Kennedy was right. Voltaire said: judge a man by his questions, not by his answers. A computer is not able, in beginning, to ask questions? Now it is not able to learn, but this is changing very rappidly now. Learning machines are starting of now. Dr. Watson, the first computer that beat men in chess, will be the first computer with a master in medicine. It could be a doctor, but will you be treated by a computer? ideation, initiative, resilience, complex communication and taking risks. These are skills which are very hard to program and hard to learn for a computer. A computer is not able to interpret. For instance, it is extream hard to teach a robot or android to select clean towels in the laundry, fold them and put them in the closet and pick up durty towels and put them in the laundry basket. So also the maids job is save the coming decades. So prepare, be one step beyond, be pre-adaptative, we have to learn skills we do not need now, but maybe in the future. (Also called exaptation in science of nature). Conclusion as well, don't fight the machines, use them and work together. So this is what I ment with 'this book is for everybody to read'. Have a joyful ride in reading this book!